In Japan, there is a collection of national holidays called, "Golden Week", April 27 - May 6. This year, the new Emperor is going to ascend the throne on May 1st, and the day will be a national holiday. As a result, this year's Golden Week will have 10 day holidays including Saturdays and Sundays. Our business is temporarily suspended during this period. We are dealing in various types of koinobori windsocks different in design and color. Also, we have several special sets of koinobori to meet your different needs. Confirm below very carefully so that you can make the best choice. 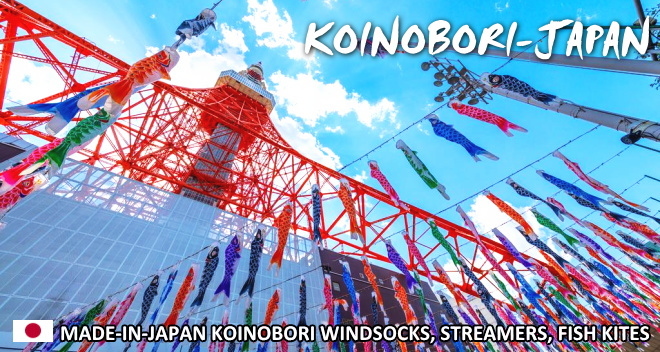 Koinobori windsocks are generally made of either nylon or polyester. 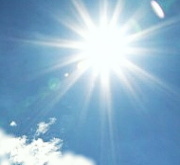 Since polyester is far stronger against the sunlight than nylon, koinobori made of polyester seldom fades. BASIC SET A basic set of koinobori presented with 5-6 windsocks in different color, arrow-shaped wheels and a rope. Please note that this basic set does not include a metalic/bamboo pole. LOOSE As your quantity-purchasing option, you can purchase separately. Select only what you need. SMALL/MINI A very small or minimum size set of koinobori with 2-3 windsocks in different color, presented with a plastic pole. A very popular item for children's playing. FOOD FISH Unique food fish windsocks including tuna, eel, bonito etc., often displayed as symbolic banners of a Japanese food restaurant. CHARMS Unique stuffed koinobori cell-phone/bag charms (black, red and blue) made of chirimen cloths, designed and handmade one by one, by a Japanese handicraft artist. OTHERS Many kinds of koinobori related items including a necktie with beautiful koinobori Kyo-nishiki's scale pattern, a shikishi art board, a koinobori-doll and many others. 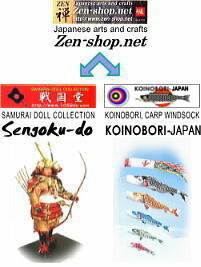 is an online shopping site specializing in Japanese traditional koinobori, carp windsocks ,carp streamers, fish kites and their related goods. Since 2001, our first online shopping site Zen-shop.net has been providing people all over the world with various categories of Japanese traditional craftworks. 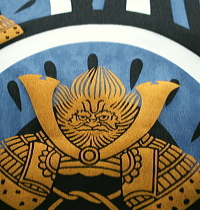 Like Sengoku-do.com specializing in Samurai warrior dolls, this new site koinobori-japan.jp has become independent from Zen-shop.net to meet our customers' needs more properly, widely and readily. Originally, the streamers were used by Samurai warriors on the battlefield. Whenever the ancient warriors were on the battlefield, they wore full yoroi armor and flew streamers. The streamers were painted in various colors and shapes. Some of them had carp pictures on them. They became "Koinobori" at the beginning of the modern age. Since the carp's courage and strength is a trait desired in boys, families traditionally have flown koinobori from their homes to honor their sons. Enjoy these beautiful koinobori unique to Japan. Copyright (C) by eCOM-project, Inc.. All rights reserved.